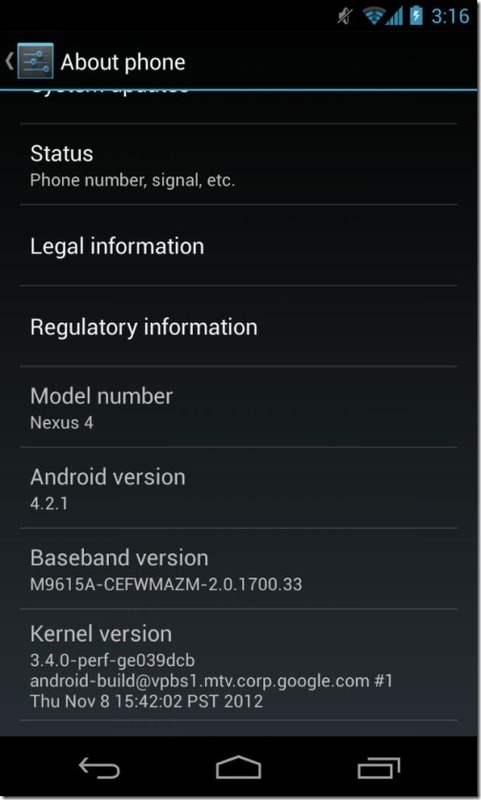 Android 4.2.1 JellyBean official update is currently rolling out OTA for the Google Nexus 4 and Nexus 10. This has been reported by several folks over at XDA and some other Android forums. There is some speculation that once the rollout for Nexus 4 and Nexus 10 is mid-way, the update might start entertaining Galaxy Nexus and Nexus 7 as well. However, the news regarding Galaxy Nexus and Nexus 7 is still unconfirmed as we have yet to see any of these devices getting an OTA notification. For those who don’t know, Nexus 4 and 10 are Android devices that were first to be released with Android 4.2 Jellybean. The said update, so far, has been seen as a fixer for the native calendar. Interestingly, in both Nexus 4 and Nexus 10, you weren’t able to log any birthdays or anniversary for the month of December. So if you were scared that you won’t be able to log in your wife’s or partner’s birthday if it happens to fall in December this year, then get updated to Android 4.2.1 JellyBean and fear no more. Apart from fixing this anniversary / birthday bug in this update, there’s no significant effect on anything else. The update only weighs around 1 MB so it is definite that apart from fixing the notorious December anniversary bug, it won’t possibly do anything else. Currently, many Nexus 4 and 10 users located in Germany and other European countries have confirmed the Android 4.2.1 JellyBean update for these devices. There are a few receivers in the US also. The baseband version of this update is M9615A-CEFWMAZM-2.0.1700.33 and converts your phone’s / tab’s Android version from Android 4.2 to 4.2.1. Check out the image below (courtesy). For those who are waiting, just keep an eye out on your phone for a Android 4.2 System update and you’ll receive it soon. For more information on the updates, please head to the original XDA sources ( Source 1, Source 2).